The Doctors Luce Pediatrics is comprised of husband and wife board certified pediatricians Dr. Mari Luce and Dr. Marcus Luce. Dr. Mari Luce, MD Background: Born in Japan and attended high school, college, and medical school in the United States at Creighton University in Omaha, Nebraska. Residency was completed at Louisiana State University in New Orleans. She was practicing with a small private practice Pediatrics group in Ogden, Utah for 4 years before moving to Beaverton. Dr. Mari is completely fluent in Japanese as well as English. She is yet again following her husband to Portland, Oregon where his family has made their home. Dr. Mari is looking forward to the multicultural living environment in Portland and her Japanese touch can be seen in everything from the daycare curriculum to the contemporary décor in The Doctors Luce. She enjoys design, fashion as well as crafts such as crochet. Dr. Marcus Luce, MD Background: Born in Oregon and has lived all over the country due to military service. 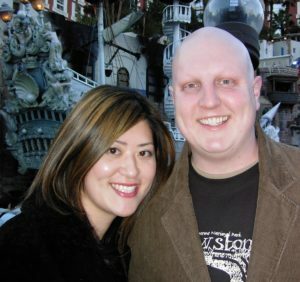 Dr. Marcus met his wife Dr. Mari during medical school at Creighton University. Due to his military commitment, he was stationed initially at Keesler Air Force Base in Biloxi, Mississippi. Hurricane Katrina closed the hospital there, so he finished his Pediatrics residency with Louisiana State University, New Orleans as well. The Air Force then assigned him to Hill AFB in Utah where he served for 4 years as the Pediatric Medical Director and Immunizations Clinic Director for a busy clinic of 5,000 children. He is excited to finally be back in Oregon and with his family in Portland. The Doctors Luce have 2 small children enrolled in the day care and are heavily involved with the local community in terms of health care advocacy and other charitable projects. Both started immensely successful “Reach Out and Read” programs at their practices where children are given free books during their well checks to encourage better speech and language development as well as kindergarten performance. Their vision for a medical home in terms of a childcare center and Pediatrics practice was born from the perceived need for improvement and a compulsion that the highest quality must be met for each child they serve. Combining health care with early education was the best possible solution in their minds, thus The Doctors Luce was born.